Now that Satyameva Jayate Season 2 is here, there is more reason for Aamir Khan’s fans to smile as it is definitely one of the best show’s in the country. The man known for his intelligent arguments and justifications, he has definitely come a long way in his career, as an actor. The perfectionist that he is, one can say he is definitely one of the keen social activists in the film industry. His Qayamat Se Qayamat tak that released in 1988 was well talked about which bought him to the ‘known’ circles. 1990 proved lucky for him as Aamir acted in over 5 films in the same year. But one can say Aamir got the perfect break in 1995, with Rangeela hitting the screens. Needless to say about this film, the cast was wonderful – Urmila Matondkar sharing the screen space with him and ofcourse with A.R.Rahman composing music for this movie, we could expect nothing but a hit in terms of the music album too – Don’t we all still like ‘Yaayire yaaryire’ from this movie? Following this, the continuous hits of Aamir Khan were ofcourse Raja Hindustani, Ishq and Ghulam. Karishma Kapoor and Aamir did a wonderful job in Raja Hindustani and infact the song ‘Aaye ho Meri zindagi mein’ became a classic hit. Moving on to Ishq, the song ‘Humko tumse pyaar hai’ became a wonderful hit amongst the audience and ghulam ofcourse as we all know boasted of the song ‘Saath jo Tera mil gaya’. A recent career track of Aamir Khan was splendid indeed with wonderful message giving movies like the Three Idiots which was even remade in tamil, Dil Chahtha yet again giving wonderful life lessons to all and not to forget Taare Zameen Par in this list. Movies like Lagaan, Mangal Pandey, Talaash is ofcourse hits and can obviously be attributed to Aamir’s sensitive role in the movie. 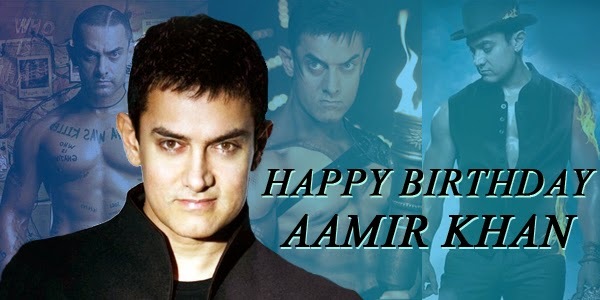 Dhoom 3 saw Aamir Khan last year showing his stylish front. A man gifted with a talent to act, we expect a lot more from him as he celebrates his 49th birthday this year.